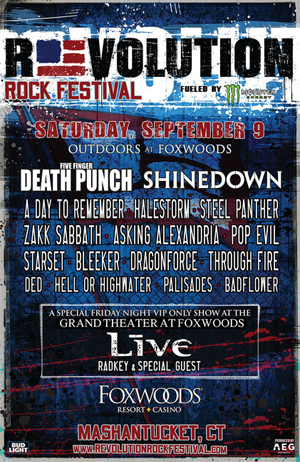 After an incredible inaugural year that drew 15,000 fans, Revolution Rock Festival, fueled by Monster Energy, returns Saturday, September 9 with FIVE FINGER DEATH PUNCH, SHINEDOWN, A DAY TO REMEMBER, HALESTORM, STEEL PANTHER and more, outdoors at Foxwoods Resort Casino in Mashantucket, CT. New in 2017, fans who purchase VIP tickets or hotel packages will be treated to an exclusive night of music Friday, September 8 at the Grand Theater at Foxwoods Resort Casino with the newly-reformed LIVE along with special guests. The full lineup for Revolution Rock Festival is as follows: Five Finger Death Punch, Shinedown, A Day to Remember, Halestorm, Steel Panther, Zakk Sabbath, Pop Evil, Asking Alexandria, Starset, Bleeker, Dragonforce, Through Fire, DED, Hell Or Highwater, Palisades and Badflower. "The boys and I have a saying in HINEDOWN. We don’t get all dressed up for nothing!!! We are so privileged to be on such an awesome lineup. Connecticut, LET’S GET IT ON,” said Brent Smith of SHINEDOWN. The lineup for the VIP-only Revolution Rock Festival Friday Night Concert features: LIVE and RADKEY, and additional guests to be announced. A special discounted Early Bird Presale starts Wednesday, May 10 at 10:00 AM EDT. Visit the Revolution Rock Festival social media pages for details and a password to purchase presale tickets. Tickets for Revolution Rock Festival go on sale to the general public on Friday, May 12 at Noon EDT at www.RevolutionRockFestival.com. All VIP tickets include premier parking, an exclusive VIP entrance, and access to the VIP Lounge which features shade, seating areas, a premium cash bar (must be 21 to purchase), premium food for purchase, and exclusive restroom access. The VIP experience also includes entry to the special Friday Night Kickoff Concert at the Grand Theater at Foxwoods Resort Casino featuring the newly-reformed LIVE, RADKEY and additional guests. All hotel packages include VIP tickets, deluxe resort accommodations for Friday and Saturday nights, plus dedicated shuttle transportation to the festival, and a $25 merchandise voucher with each ticket. A limited number of discounted tickets will be available for active military through Revolution Rock Festival partner GovX (www.govx.com). Revolution Rock Festival is produced by AEG Presents, producers of Rock On The Range, Monster Energy Carolina Rebellion, Rocklahoma, Rockfest, Northern Invasion, River City Rockfest, High Elevation Rock Festival and other U.S. rock festivals. Revolution Rock Festival is supported by our rockin’ sponsors: Monster Energy and Bud Light. These partners, along with many others, will feature interactive experiences, artist meet & greets, and other unique fan engagement opportunities throughout the festival.